Gimme some dimensions and we'll see what we can do! Honey, can you throwme down another beer? "but honey, think of all the places we can boondock now!!!" Then, Watch as the TRAILER-SAURUS backs into a site CRUSHING TWENTY (echoing) PICNIC TABLES and DECIMATING EIGHTY FIRE RINGS!!!!!! Sounds like ......the new, improved, campermatic. By Ronco! "Honey, you know how the chiropractor said my back problems were from bending down to open the waste valves? Well....problem fixed!" "You know they make electric waste valves.....don't you?" "Honey...you know how ol' Fred at the shop has been spouting off 'bout getting himself that thar fancy new 40 foot fifth wheel? Well, were goin' show him a thing or two!" 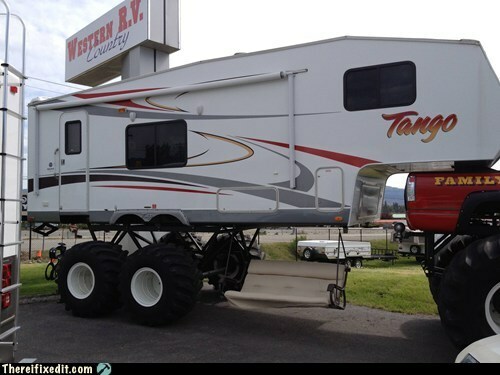 "Dear... you know Fred's fifth wheel is 40 foot loooooooong, don't you?" "Laugh at me last year, will they! I'll show them, I'll show them all!"